The vision of NICIS is to provide a forum that will promote transformative advances in the care and science of patients with critical neurological illness and injury. The 2018 Neuroscience in Intensive Care International Symposium in America (NICIS-America) is devoted to the theme of coma and consciousness in medicine. Consciousness is an emergent property seen in complex systems. The study of human consciousness cuts across disciplines and endeavors to include clinical medicine, psychology and the cognitive neurosciences, ethics, literature and philosophy. Changes in the level of consciousness are observed across the health spectrum, in physiological phenomena such as sleep, during sedation and anesthesia, and in pathological states such as seizures, traumatic brain injury, stroke, and severe physiological or metabolic imbalances affecting neuronal function. Speakers include thought leaders in neurology, neuroscience, intensive care, neurophysiologic monitoring, neuroimaging, brain mapping, statistical modeling, predictive analytics, advanced clinical trial design, knowledge transfer, and technology development. “The vision of NICIS is to provide a forum that will promote transformative advances in the care and science of patients with critical neurological illness and injury,” said John Waslif, Managing Director of Arrowhead Publishers and Conferences. Dr. Claassen is a nationally and internationally recognized expert in the treatment of neurological intensive care, and an expert in status epilepticus and brain hemorrhage. Dr. Stevens’ primary goal is to discover patient-specific biological signatures associated with injury and recovery following life-threatening insults such as trauma, stroke, anoxia and sepsis. Dr. Suarez has investigated neuprotection, blood pressure management, and stem cell infusions in patients with subarachnoid hemorrhage, intracranial hemorrhage, and subarachnoid hemorrhage. Dr. Akbari applies a multidisciplinary approach to investigate the mechanisms and neurobiological basis of coma, including principles of cardiac arrest and cardiopulmonary resuscitation (CPR) along with neurophysiologic monitoring and behavioral studies. Emery Brown, M.D., Ph.D., Edward Hood Taplin Professor of Medical Engineering & Computational Neuroscience at MIT; and Warren M. Zapol Professor of Anaesthesia at Harvard Medical School Computational neuroscientist and anesthesiologist, Dr. Brown explores what happens to your brain under anesthesia to aid in understanding the nature of consciousness, improving the specificity of anesthetic drugs, and leading to new treatments for chronic pain, depression, and insomnia. The NICIS-America Symposium (http://www.nicis.org) builds on a highly successful conference and networking event held annually in Paris since 2010 (http://www.nicis.fr/). 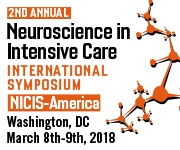 NICIS brings together clinicians and scientists who share a common interest in translating discoveries in the neurosciences into better patient-centered outcomes. The conference is designed for an interdisciplinary and multiprofessional audience of clinicians and investigators working in neurological injury, neurocritical care and stroke. This includes basic and translational scientists, neuroscientists, intensivists, neurointensivists, neurologists, neurosurgeons, neuroanesthesiologists, neuroradiologists, physiatrists, psychiatrists, and neuropsychologists. There are several ways to get involved. To register for the conference, submit a scientific poster, or to participate as a sponsor or exhibitor, visit: http://nicis.org. Arrowhead Publishers and Conferences brings life sciences industry professionals together to help move research forward through learning, networking and professional growth. Arrowhead focuses on offering thoughtfully curated speakers, new research industry trends, case studies, emerging discoveries and the future focus of the biotech and pharmaceutical industries. Arrowhead conferences cover clinical development and cutting-edge research, regulatory issues and market dynamics, therapeutics, drug discovery and positioning, and emerging technologies for both clinicians and pharmaceutical professionals.